Here are some of his conclusions from reviewing the data. No peripheral country – where protests are the loudest – or France et al have posted a reduction. 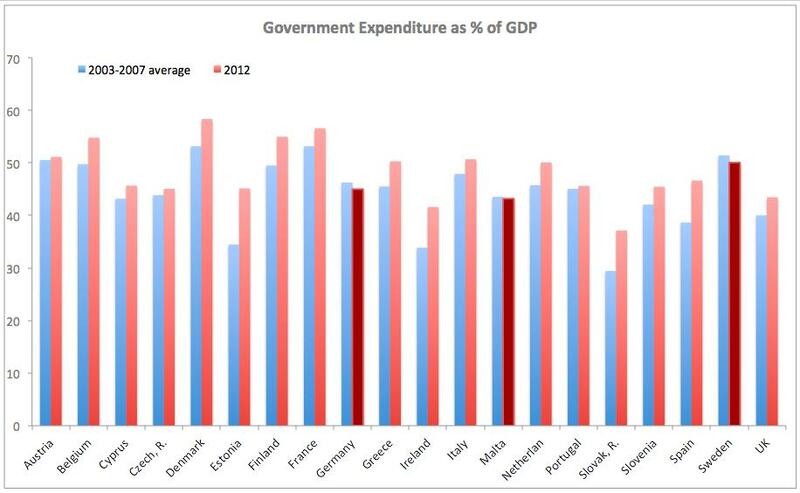 In France, Government spending rose 3.44 ppt on pre-crisis level as % of GDP, in Greece by 4.76 ppt, in Ireland by 7.74 ppt, in Italy by 2.773 ppt, in Portugal by 0.562 ppt, and in Spain by 8.0 ppt. Sweden and Germany are among the three nations that have reduced the burden of government spending as a share of GDP, and both of those nations are doing better than their European neighbors. Switzerland isn’t an EU nation, so it’s not included in Constantin’s chart, but government spending as a share of economic output also has been reduced in that nation over the same period, and the Swiss economy also is doing comparatively well. The moral of the story is that reducing the burden of government spending is the right recipe for sustainable and strong growth. Growth also is far more likely if lawmakers refrain from class-warfare tax policy and instead seek to collect revenue in ways that minimize the damage to prosperity. Unfortunately, that’s not happening in Europe…and it’s not happening in the United States. A few countries are moving in the right direction, such as Canada, but with still a long way to travel. The best role models are still Hong Kong and Singapore, and it’s no coincidence that those two jurisdictions regularly dominate the top two spots in the Economic Freedom of the World rankings. The welfare state’s flatter effort-reward curves do not provide enough motivation for European citizens to compete with three billion ascending emerging world souls. At least not enough motivation to justify a three to four fold prosperity multiple over the world average. Hence convergence down towards the worldwide average is in fast gear for Europe. That is the fundamental global force of reordering that is at work in this early twenty first century. All you see in Europe these days are essentially manifestations and details of how this convergence is proceeding. Predictably, many narratives of denial have emerged to appease desperate European populations into a few more years of delusional comfort. It’s too late to steepen the effort reward curve now, the only thing that could possible reverse the decline. Vast majorities will never sign up for it. The point of no return has long passed for Europe. Only the exact mode of decline remains to be seen. Class warfare with taxation and providing govt jobs is the way to guarantee the incumbent re-election. I am from Jamaica and our economic numbers are the worst out of all countries in the last 40 years (at least in the Western Hemisphere). You can analyze Jamaica as a case report to destroy Krugman and other Keynesians….Footnote: Our Minister of Finance (who just inked a deal with the IMF) had recently stated that he was more Keynesian than most.